How does your kids' mind work? Can you think on your feet and and work together as a team? These two skills will help you conquer Word on the Street Junior. When playing this game with my kids, I get to see how their listening and spelling skills are improving. For example, my kids can think of all types of words for a particular category. While it's great that they can think on their feet, the key is spelling. Unfortunately, the multi-syllabic words are ones that they can't spell. A certain word may have the "f" sound but it is spelled with a "ph" or there might be a silent n that the kids forgot. Of course, it is a team effort so we help them. Still the game re-enforces spelling and sounding out words. Word on the Street Junior is available at online at Out of the Box games as well as many mass merchants. It retails for $22.99. This holiday season full of family togetherness and game nights get the mind working. 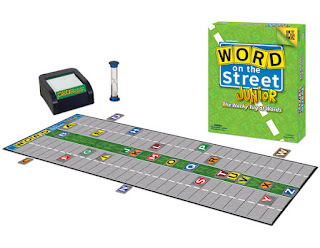 Play Word on the Street Junior and watch how quickly everyone can think on their feet.